KoopaTV: MOTHER 3 is Coming Soon! By LUDWIG VON KOOPA - That, or Reggie Fils-Aime has mother issues. Thanks to Nintendo's perceived mismanagement of its IP, there are hundreds of thousands (or millions) of zealot fans who have a persecution complex. I mean, we just wrote about how Metroid fans feel persecuted all the time, erupting over the unveiling of Metroid Prime: Federation Force. An even smaller, more dedicated fan-base? The MOTHER fans, who just scored a huge victory with EarthBound Beginnings this E3. They probably can't see why all the other fanbases are complaining! This is on top of their victory two years earlier (like, July 2013) for EarthBound to also appear on the Wii U's Virtual Console. That just leaves one MOTHER game left in the series to come outside Japan: MOTHER 3. ...While what ultimately happened with Satoru Iwata was definitely tragic, it makes one wonder. I think Iwata knew that his time was coming when it was E3 2015, hence the puppets and his missing attendance. If Reggie really is a MOTHER fan (a "huge" and "big" one) but this mysterious announcement schedule is preventing it, then perhaps one of Iwata's very last orders as both CEO of NCL and CEO of Nintendo of America was to bring the other MOTHER games officially localised outside of Japan. When EarthBound was released on the Wii U, it was the first time Europe got it. EarthBound Beginnings's release was the first time it was released on any non-Japan continent. ...So that means MOTHER 3 is coming up, right? 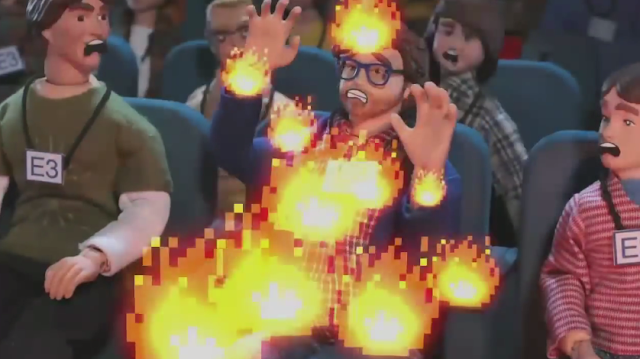 "COME ON REGGIE GIVE US MOTHER 3!" ...Probably yes, actually. EarthBound Beginnings being released is very convincing evidence that MOTHER 3 is to follow, especially since everyone knows EarthBound Beginnings is a lot more unplayable than MOTHER 3. But if all three are gonna come out, it makes sense to save the best for last. And it'll make people think they gotta buy EarthBound Beginnings to incentivise the localisation for MOTHER 3. ...Yeah, I don't believe that Reggie really is this closet MOTHER fan, considering we know he's a fraud in relation to Super Smash Bros.. Still, he better not dishonour Iwata's memory by going against his final order. And if he's clearly aware of the demand for MOTHER 3 to come over and if it's enough, then it makes all the sense in the world for it to show up. ...Say, isn't it a little strange that EarthBound Beginnings was released within a month of Iwata's death? Almost like it was planned that way. Everyone on social media advocated playing EarthBound to commemorate Iwata's death, so EarthBound Beginnings was released with enough time so everyone could play its prequel. And to make sure everyone knew about it, they announced it on the night of the Nintendo World Championships when everyone was watching. ...And they kept it distinct from the actual E3 presentation so it wouldn't be associated with disaster. EarthBound and EarthBound Beginnings are gonna show up high on the eShop rating charts following Iwata's death, I assure you. And if MOTHER 3 isn't going to follow up on this, then Reggie probably has some personal life issues concerning mothers he needs to work out. We don't know much about his personal life, though he's had a previous marriage with kids that came out of that. Do they have mother issues? According to Wikipedia, those kids number three. Forget this Half-Life 3 conspiracy: We gotta start looking into this in terms of MOTHER 3! This article exists because of a request. You should submit your own topic request for one of KoopaTV's staff to write about, and we'll eventually fulfil it! Submit a request here! Ludwig posted a few Miiverse posts for EarthBound between September 2013 and November 2013 that you can check out here at NNID PrinceOfKoopas. He still hasn't purchased EarthBound Beginnings. But he probably will some day, and he would certainly buy MOTHER 3 on the Wii U! Seriously, people think Nintendo should just buy other companies' IPs when they can't handle their own. More on just that silliness here. Alternate theory on EarthBound Beginnings and why it's appearing: And it has to do with Ninten. People do not believe Ludwig's prophecy here, but he's sticking to it, even after MOTHER 3's 10-year anniversary passed. At long last, “soon” has apparently arrived! It's MOTHER 3! Released! At this point, they HAVE to release MOTHER 3. Iwata died to keep us happy, and they won't pay him the respect of showing the rest of the world such a masterpiece? Well, all I can say is.. I'm patiently awaiting the official release of EarthBound 2. There is no doubt in my mind that MOTHER 3 will be coming, especially after Iwata's departure. You could be a Mega Man fan. I'd be shocked if they released EarthBound Beginnings with no plans to release Mother 3. So JoystickLad would be pissed, you'd be shocked, and I'd be wrong. ...C'MON MOTHER 3 COME OUT. That said I anticipate it to come out no earlier than the end of the Wii U's lifespan.